Industrial designers are always looking for ways to improve user interface controls by combining functionalities of rotary switches, pushbuttons, trackballs, potentiometers, and touchscreens. In doing so, they can save on component costs and streamline the user experience. Now, Touch Encoder technology is available that helps modernise and simplify designs, while also making it much easier to support applications with multiple languages or configurations. Designers face a myriad of options for equipment and device user interface and each one has its place in today’s designs. Table 1 is a quick overview comparing available options. Today’s sophisticated devices may have user interface panels with as many as twenty components controlling, tuning, or adjusting functions. For many devices, there is a clear advantage to Touch Encoder technology, which shrinks the user interface footprint by combining multiple devices such as touchscreens, pushbuttons, trackballs, and switches into one product - replacing all of these components with one control. Depending upon how a designer configures the interface via the tablet-based application development software, a user could start off on a home screen, then adjust functions and tweak 3 or 5 different parameters, reducing a panel switch count from up to ten components down to one device. 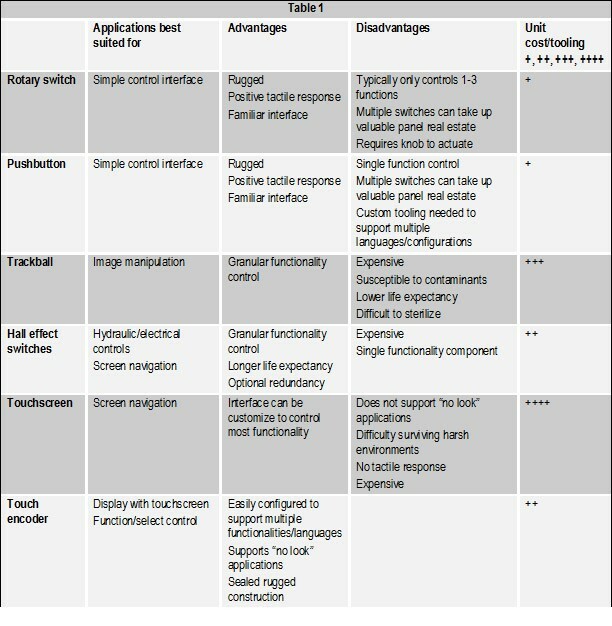 Several trends favour the use of newer user interface technology, including Touch Encoder. First and foremost is the global nature of today’s marketplace. Manufacturers building products in one country and then selling these products globally must now support multiple languages - often from five to ten different languages per device platform. Now, device manufacturers either need to standardise legends or icons (which requires additional training for the end user to understand) or support multiple languages on the device user interface through multiple legend variants. Finally, the widespread use of tablets and mobile telephones is changing users’ expectation of what an interface should look like. Users are demanding a touchscreen interface, even for some non-traditional applications - where people need to perform no-look operations. That is where Touch Encoder technology excels, because it can marry the user desire for flexible icon-based navigation with controls users can easily find and interact with - without having to look down at the display. The new Touch Encoder technology can be used in a number of markets, especially where shrinking the user interface footprint is important in new designs. For example, medical device product engineers can use a Touch Encoder to simplify designs for equipment controls in ultrasound, patient transport, and sterilisation equipment control applications. The accompanying photo shows an example of an ultrasound panel in which a Touch Encoder simplified the panel design by replacing existing keypads, a trackball, rotary, and pushbutton switches. The Touch Encoder provides users a vivid high resolution screen that is completely customisable, making it much easier and less costly to support multiple languages. On this ultrasound panel, a Touch Encoder replaced four switches, a trackball and eight buttons. For the industrial market, the Touch Encoder can be used for fabrication and production assembly equipment and for Surface Mount Technology (SMT), as well as appliances. Product development engineers in these markets tend to be cost conscious looking for a cost-engineered user interface with as much functionality as possible. 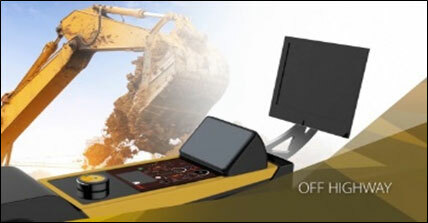 Touch Encoder supports no-look operations in off-highway vehicles. For them, removing multiple buttons can save costs in unit price and tooling costs. A simplified interface also helps with training, since workers do not have to navigate through a complex user interface on a cumbersome panel to operate a piece of equipment. Anyone who can use a cell phone could walk up to a machine and quickly become proficient with this intuitive device. 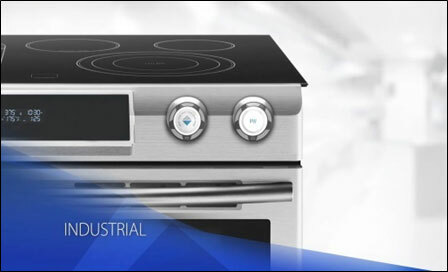 Removing multiple buttons can save costs in industrial equipment and appliance designs. For the vast majority of applications, designers use a Universal Serial Bus (USB) or CANBUS protocol for communicating data between the Touch Encoder and the host processor. For example, once a developer writes an app and downloads it onto the device, users can plug the Grayhill Touch Encoder into a computer, and it will instantly recognise the device providing ease of integration. In off-highway, industrial and some medical devices (interventional devices, X-ray or CT scanners), a CANBus protocol is used to conveniently communicate with multiple devices on the same bus interface. 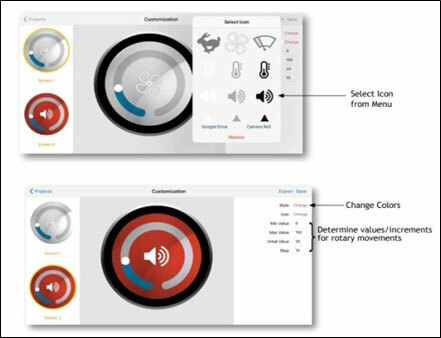 In the digital audio visual market, designers can use touch encoders to enable users to perform multiple functions from one control. New Touch Encoder technology, like the Grayhill Touch Encoder, is built to survive harsh environments without sacrificing style or functionality. The Touch Encoder uses a non-contact Hall-effect sensor to provide coded output, determining the position based on feedback from the sensor. Designed with a sealed, rugged construction, it is also impact resistant and will survive environments in which other user interface devices would fail. In addition, the Touch Encoder has been engineered to have excellent haptics - providing consistent and crisp feedback to the user, and ultimately showcasing the high quality of the device or end product. The switch detent is repeatable and stable over its life in environments where it can be subjected to wide temperature ranges, electrical noise, vibration, and shock. The Touch Encoder has a vivid high resolution colour display. It supports no-look operation, multiple configuration options, and can incorporate tap, swipe, and rotation gestures. Using the Touch Encoder makes it much easier and less costly to support multiple languages. Those transitioning from older designs can use the Touch Encoder to get a modern design with much more information than available on a monochrome or low resolution colour display. To make the new Touch Encoder technology capable of placing so much functionality in one control, ease of application development is paramount. To achieve this goal, the Grayhill Touch Encoder uses an extremely simple tablet-based development kit that allows anyone to develop a custom interface. Industrial designers can personalise multi-touch gestures, generate images, customise the display, and trigger the logic themselves, without needing a software engineer to configure the device. Designers communicate to the Software Development Kit (SDK) through wireless technology, so no hard wiring is required. After receiving the development kit, designers simply unpack it and immediately get an overview of how to write a programme using the application on the tablet. Within a half hour, users will be writing programmes and downloading software, making the entire development process extremely comfortable. Anyone can develop a customised interface using Grayhill’s intuitive tablet based development application. By combining the functionality of a rotary switch with a touch display, the Touch Encoder bridges the user generation gap without sacrificing the goal of creating an intuitive user experience. 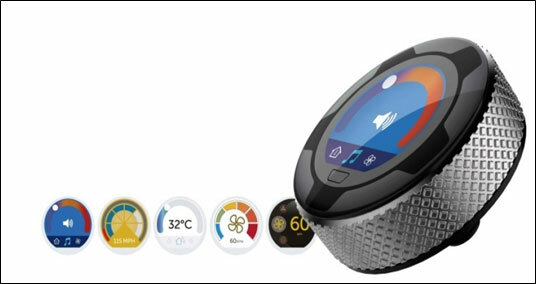 Users can navigate through the interface by swiping and tapping through the touch display while fine adjustment of parameters can be accomplished with the ring encoder. The consistency of haptics of the tactile feedback conveys the traditional expectations of quality, while the vivid colour display provides the palette to showcase the product branding to ensure a positive first impression. The goal of any user interface device is to make the experience of interacting with device both intuitive and enjoyable. The Touch Encoder offers product designers a stylish and versatile interface built with an engineered toughness to perform in the harshest environments. Using the tablet based development app, standard widgets on the Touch Encoder can be easily customised for specific applications.